Artistic rendering of the future B&B accommodations at Cass Estate Vineyard in Paso Robles, Calif. Courtesy of Ecotech Design. Paso Robles, Calif.—As Paso Robles embraces urban winery development with its downtown public market and a new industrial winery complex, estate wineries also continue to expand production and hospitality facilities to capitalize on the region’s growing popularity among wine consumers. Cass Estate Vineyard and winery, located in the Geneseo district of the larger Paso Robles AVA produces 10,000 cases annually with an average bottle price of $28, according to the Wines Vines Analytics winery database. 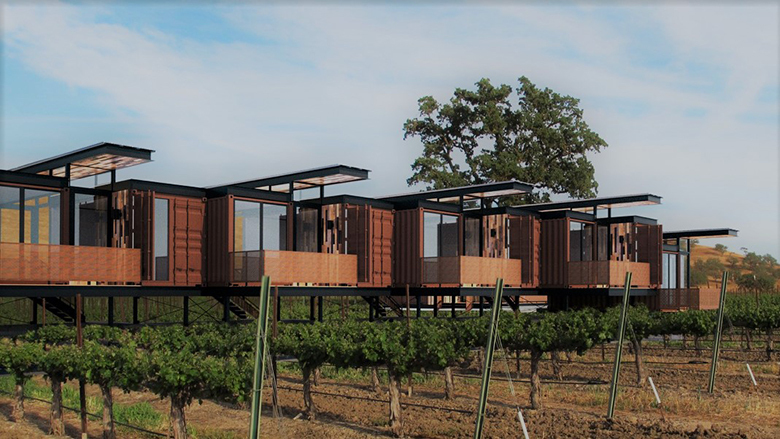 The estate is home to 145 acres of vines planted to both Rhône and Bordeaux varieties — and soon, shipping containers-turned luxe accommodations. The idea of using upcycled shipping containers may not sound “nice,” but Cass is working alongside Walter Perry, principal architect for Ecotech Design, a Los Angeles-based architecture firm specializing in modular units. The containers, which are fresh off ships arriving from China, “so, only used once,” said Cass, have been approved by the state of California — a process Cass said went very smoothly. Cass explained that once the containers arrive, the fabricator cuts away any unneeded steel walls and installs doors, windows, plumbing and electrical. The modular units are then shipped to Paso Robles, where local tradesmen complete the final construction. “My local contractor is Ted Plemons, who also happens to be my partner in the winery,” Cass said. The barrel room will also feature floor-to-ceiling glass doors and windows, providing vineyard views. The entry will include a bar area, covered outdoor seating and, Cass said, once construction is complete, vines will be planted as close as possible to the new building. Looking toward the future, Cass said the winery plans to host a farm education program that will include honey harvests, apple cider making, grape harvest experiences and commercial gardening classes. Also in August, Parrish Family Vineyard opened its new winery and tasting room set in the winery’s 30-acre estate vineyard that is planted to Cabernet Sauvignon, Cabernet Franc, Malbec, Petit Verdot, Syrah and Sauvignon Blanc. The family purchased the property in 2014 to add to its holdings in the Creston and El Pomar districts. The Parrishes have agricultural roots dating back to pre-Prohibition, when first generation grape grower Earl Henderson planted and managed 740 acres of vines in Atascadero. But the business didn’t survive the Great Depression and Prohibition, and Henderson had to sell off his vineyards during that time. It wasn’t until 1995 that co-owner and winemaker David Parrish planted 40 acres of Cabernet Sauvignon in Creston. Nine years after that, in 2004, he began producing wine from the estate in a shared wine processing facility in Paso Robles. The increase in space also means a potential increase in wine production. Parrish said the winery is permitted to produce up to 8,000 cases; and he currently is producing 3,500. “We are continuing to develop our Bordeaux portfolio and now have a Malbec and a Cabernet Franc; as well as a Bordeaux blend called Four Chords as part of the 2016 estate harvest. We hope to continue adding more wines,” he said. Until last month, Parrish Family Vineyard’s tasting room had been in the heart of downtown Paso Robles. “We have loved being part of the downtown Paso Robles community for the past seven years,” said Cecily Parrish Ray, David Parrish’s daughter and the winery’s general manager, in an email to Wines & Vines. “It was a difficult decision to move … but we outgrew it and wanted more room to offer meaningful experiences that require a larger space,” she said explaining that the confined 20-seat space not only limited the number of guests she could host, but the quality of her customers’ experiences. The winery will also offer winery and vineyard tours, a creek walk for guests to see the restoration of Adelaida Creek, as well as wine and food-pairing experiences made from the winery’s new commercial kitchen. “I am currently baking our bread on-site, which has been exciting as we wanted to showcase a sourdough started by our Cabernet Sauvignon grapes,” Parrish said.